1887 Bussey and McCloud,Troy,NY.Very ornate design, brass finial, swingtop cook top, side load, nickel base, mica view, top vent. It’s got it all! Circa 1908. 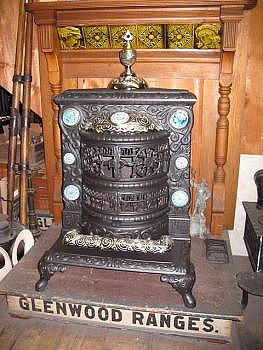 Classic Glenwood parlor stove, burns wood & coal. Nice medium size, very popular selling stove. Small to large, 14&apos;&apos; pot to 20&apos;&apos; pot.Very ornate and well built. Restored. This great stove comes in 3 sizes and prices to suit almost every need. Perfectly restored and nickeled. 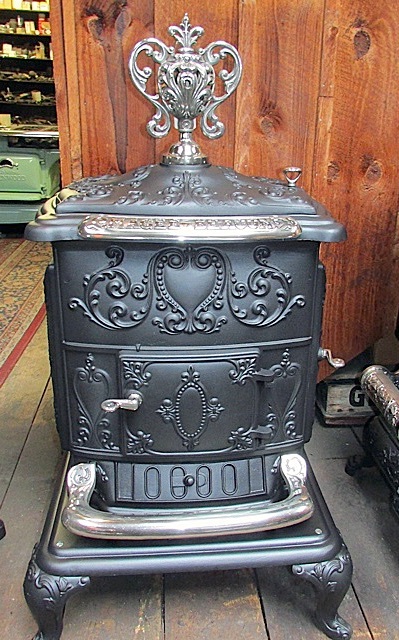 Built in Syracuse, New York, this completely restored antique parlor stove is ready to heat. 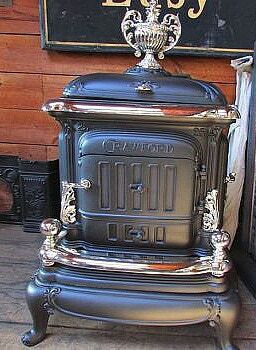 Modern Glenwood Wood Parlor stove by Weir Stove Co., Taunton, MA. Circa 1908. Large size, great heating stove in mint condition. Very popular stove that will warm your home. 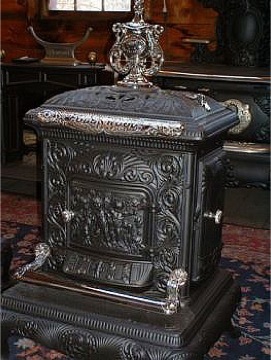 Medium sized cherub wood parlor stove. Will take 18" wood easily, and has a good capacity for heating long hours. Circa 1890. One of our most popular and beautiful wood heaters. It is embossed with three dancing cherubs and a dog on the front door. The door opens to reveal the fire. 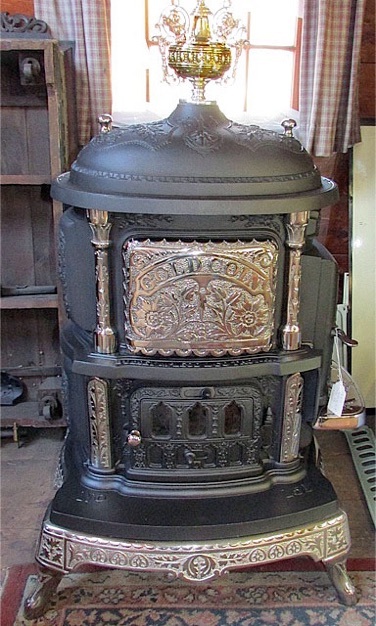 Standing 62 inches high, this Lansing Michigan built stove is top of the line. 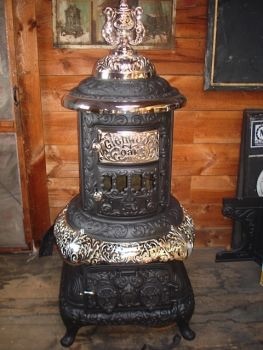 Very ornate casting and a large nickel boot rail on three side to warm your feet. 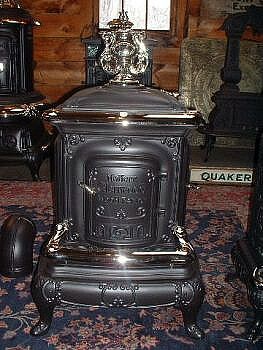 This is a wood only stove and is in mint mint condtion. The brass finial is superb. Top vent. This one is sold, but we have two more that are similar. Please call for more information. 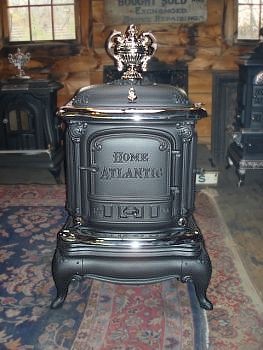 Clean stately design is featured in this 1910 Home Atlantic stove. Made in Portland, Maine, this stove features a swingtop, fireview and a convienent sideload. A rear vent makes it easy to install into an existing fireplace or as a stand alone antique stove. 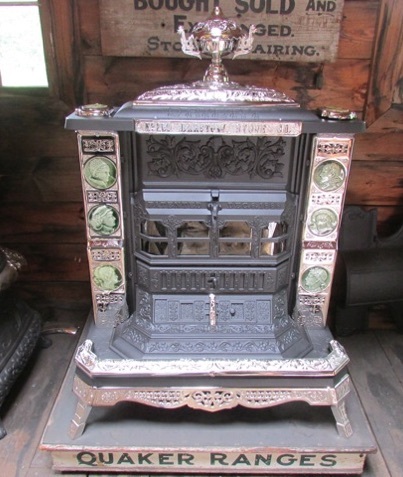 This mint condition antique wood parlor stove was made in Taunton, Mass in 1896. Crested by a fabulous brass urn, the castings include fantastic details such as the cherubs and fine scroll work. In like new condition. 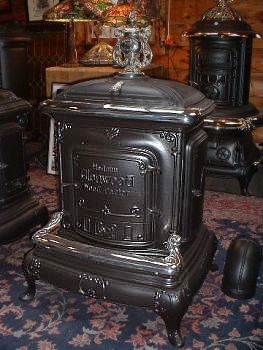 The #22 Clarion wood parlor antique stove was made in Bangor, Maine in 1892 by the Wood, Bishop Company. Featuring a brass swing urn, top loading, gold tiles and an wonderful mica view on front. This stove will take a large load to burn for many hours. 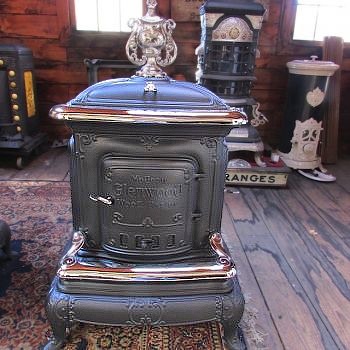 The smallest sized Glenwood wood parlor is one of our best selling stoves. It features swing dome revealing a cook surface, side loading door and front door opens to reveal the fire. A very handsome solid wood heater. 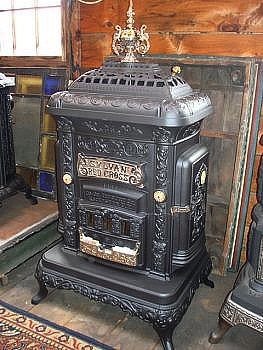 This coal burning parlor stove was built in 1890 in Troy NY. The 7 beautiful aqua blue tiles surround the art nouveau inspired design. 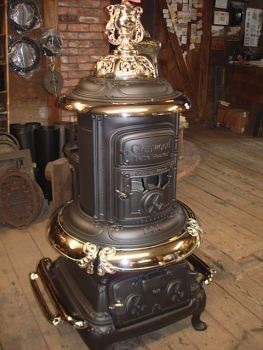 This top of its class antique stove has a large fire pot for hours and hours of heat. Mica windows complete its classic look. 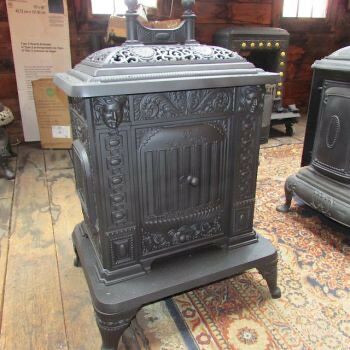 Another large capacity antique parlor stove that is top of the line. Built in 1890 in Geneva, New York. All nickel base with a brass finial and nicely ornate design overall. Featuring a swingtop and cooktop. A great solid stove to provide heat. 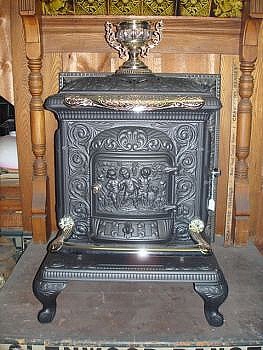 Built in 1897, this wood burning parlor stove is nicely decorated in both the castings and the 4 tiles. Featuring a swingtop, cooktop and a full basestand, this large capacity stove is ready to enjoy. Made in Rochester, NY. Made by Walker and Pratt Co. Boston. A great working woodstove with cooktop, sliding frontdoor screen to view fire. Comes in 19, 22 and 25&apos;&apos; wide body. Lots of nickel accents.Prices at $2000, $2200 and $2500. Bordered by 6 beautiful green facial tiles. Nice fireview. Lift-up door for loading wood or coal. Swing top decorative urn, lavished in nickel. 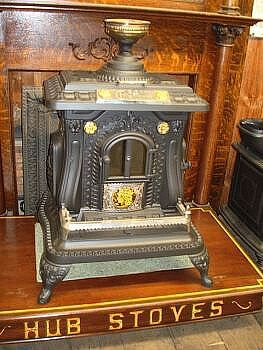 A real gem of a stove, one you&apos;re not likely to see elsewhere. DIMENSIONS: 36" wide, 24" deep, 50" high. Circa 1900, made in Portland Maine. Lovely ornate design of cherubs making fires. Mint condition, swingtop, sideload,front door for fireview. 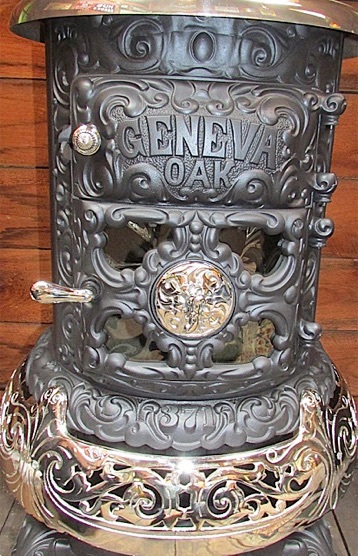 Awesome stove! 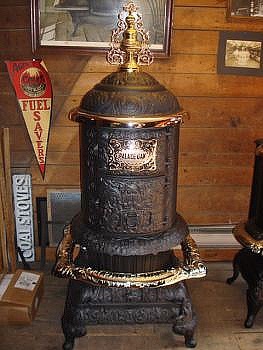 Made by Philips and Clark Co,Geneva, NY about 1900-05.This is a large wood-coal stove,ornate design, lots of nickel,full nickel base,4 big mica windows to view the fire. Dimensions: 64H x 26W x 26D. Made in Boston in 1907.It is in solid, mint condition, with crisp detail. Dimensions: 46H x 24W x 22D. 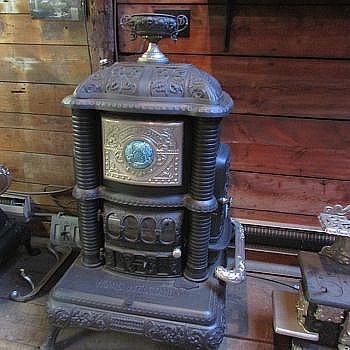 Barnstable Stove Shop has over 500 antique stoves in stock: antique wood burning stoves, antique coal stoves, gas kitchen ranges, and parlor stoves. 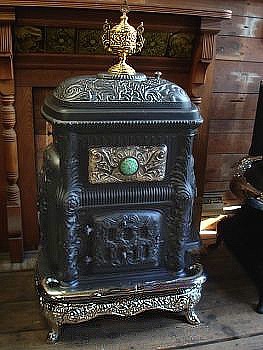 All stoves are properly professionally restored and ready for installation.